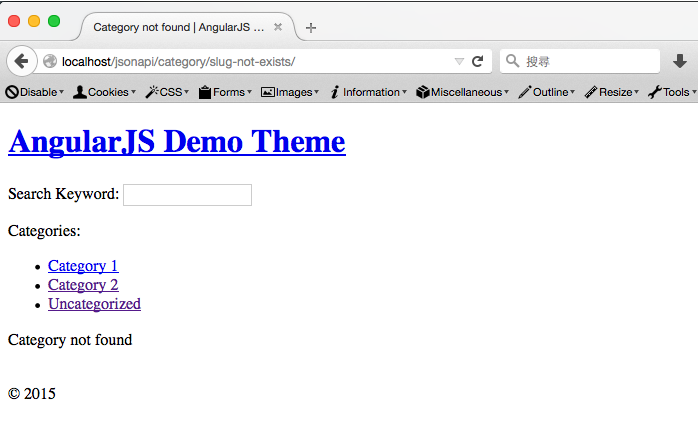 It’s good to see you in the latest post of my Building themes with AngularJS and JSON REST API series, I hope you enjoy the previous tutorial about pagination in AngularJS WordPress theme. Today I want to show you how to deal with “page not found” scenario in our project. You might be a little bit surprised that we’ve sort of talked about it when we learned the “otherwise” method in $routeProvider. It turns out that we still have a few things to cover. So if you have a couple of minutes, just open your favorite code editor and get started. 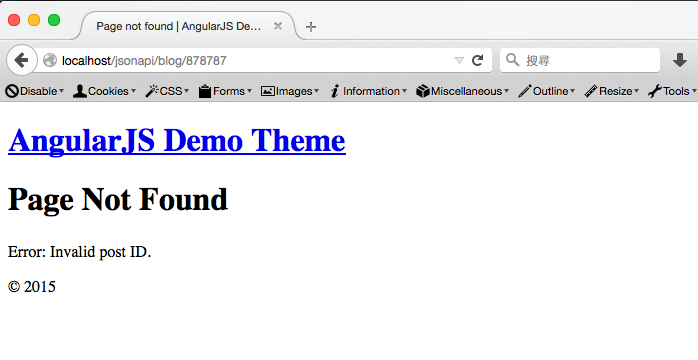 From the project repository on GitHub you can get an AngularJS WordPress theme last time we’ve built. If you’re new here, in the series of tutorials I just tried to share my learning path about building a WordPress theme with AngularJS. So far we’ve built one with category archives and pagination, and also a functional search form in it. You can just download it and focus on this tutorial right away, though I do encourage you to check other posts out in your spare time. As I mentioned in the beginning, the first “page not found” scenario we can easily deal it with the otherwise method in $routeProvider. 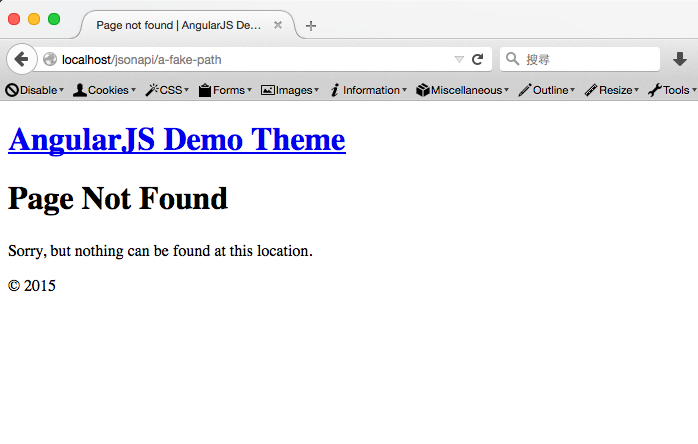 The second “page not found” scenario is that a visitor may come to a page perfectly match a route path, let’s say if someone visits a post which have been deleted, the location should match our “/blog/:ID” path, but AngularJS will fail when requesting the post from WP REST API with the $http service. If we just leave it alone we’ll get a blank page when we visit such locations. It’s very confused to any visitor so we should definitely improve it. line 8: Besides res, we also add status parameter to the error function. line 9: When the error status is 404, a typical “page not found” status code, we’ll manipulate our view to notify our users. line 10-12: We add a new property to $scope called is404 and set it to true, change the document title to “Page not found” and add an errorMessage property which is the error message we get from the response. Now you get the idea that we need to check all route paths to ensure there are corresponding “page not found” messages for each of them. If you try to add an error method like we did in the Content controller, you would be surprised that it didn’t work. That’s because when we use the endpoint “taxonomies/category/terms/?filter[slug]=slug-not-exists” to get terms, it will return an empty array instead of error responses if the term doesn’t exists. The last “page not found” scenario is when a paged archive doesn’t exist. For example, if you change the “posts per page” settings to a larger number, like from 6 to 10, paged archives with higher numbers will be missing. isNaN, which means if the currentPage variable is “Not-A-Number“. larger than the headers(‘X-WP-TotalPages’). If so, such pages should not exist. And we update the document title and pageTitle property accordingly. I hope now you get the idea that why I’m writing this tutorial to talk about all scenarios, because it’s really not just about “page not found”. As a developer we should also consider user experience whenever we can, so providing descriptive error messages is the least we can do. 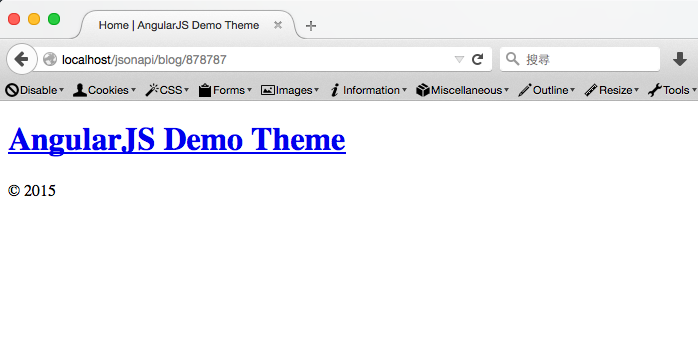 I promise you in the next tutorial I’ll show you how to tidy up our scripts.js by creating an AngularJS service. In the meantime, you can download the final theme from the GitHub repository and have some fun. Don’t hesitate to contact me if you have any question when following these tutorials I wrote. I’ll get back to you as soon as I can. Just wanted to tell you how great your tutorials are and that I can’t wait for your next post!! Hey I’m flattered! Just stay tuned, the latest tutorial will be out this week. Talk soon! If you set the content route to “/:slug” without any prefix, the otherwise route won’t work cause any path will be considered valid – they’re all match “/:slug”. Change to something like “/blog/:slug” and see if it works. Cheers. Does this work on single pages (content.html) for navigating between posts? yes, of course. I think it falls into the type I mentioned – “2. When a post doesn’t exist”. but does not work properly, everything woks fine but when I copy and paste the url in another windows.. does not load the script… do you know what is it the problem? Are you still working with a WordPress theme? If so, please make sure you’ve update the Permalink Structure in your WordPress Settings. I’m sure if you’ve followed my tutorials, the # should be removed by default. I’m getting the 404 from wordpress when trying to route to a post ID. Any ideas how to bypass this and get the request sent to the angular router? Thanks again for terrific learning materials so helpful! Hi Tom, please send me a copy of your theme to yoren[at]1fix.io so I can help debugging. Thanks. Great tutorials, thanks! How do you manage browser refreshes? I’m getting a 404 when I refresh a page on any other route the the root route. So say I navigation to http://www.example.com/mypost and refresh that page I get a 404. Any tips on how to handle that? If you’ve done things right, you shouldn’t get 404 when refreshing pages. Do you set the right permalink structure in your WordPress? It should be identical to the routes in your AngularJS app. I doubt there might be something wrong in your AngularJS scripts, just paste it to Gist so I can check it for you. 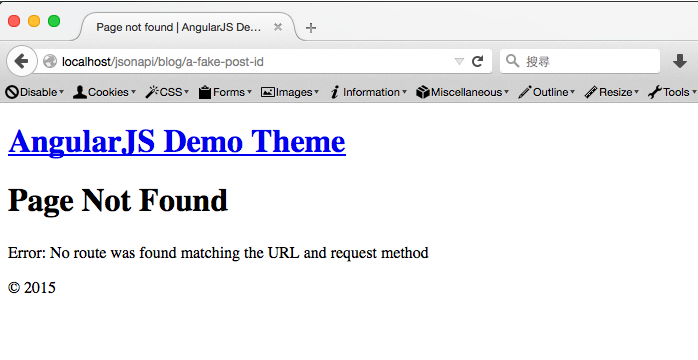 How can we Post in angularjs using type script or with out it. I am trying to write to Json file using the post method but it gives me error “POST http://localhost:1989/client/app/travelrequest/Json/data.json 404 (Not Found)”. When i try to read the Json file with Get method it works. Sorry, I am so busy to find a solution that I even forgot to say Hi. To use POST / PUT method you need to be authenticated. It’s a more advanced topic please refer to WP API documentation first: http://v2.wp-api.org/guide/authentication/. If you’re building a WP theme or plugin, you can see if this post of mine helps: https://1fix.io/blog/2015/10/11/cookie-authentication-wp-api-angularjs/. Great what you are doing to help some like me. Yes I have doubt about ionic and angularjs , so I was working a while to know how to get single page of my wordpress blog. Do you have plese any idea? Hey Alex, did you set your WP to use “pretty links” in your Permalink Settings? That should fix the issue. Yes I have tried that. I was wondering, I am using $stateProvider instead of $routeProvider. Do you think this may be the difference? Also, from googling around, I see that the issue may be within the .htaccess file. Is there a way this file needs to be read for routing with $stateProvider? Thank you for your help. on About page, if you click browser refresh, “Page not found” is displayed on the browser tab. Hi Alex, can you take a screenshot of the permanent link settings for me? This is very typical that WP is telling you the pretty link structure is not working.